Host Your Own Film Festival! Filmed by Bike is inspiring a culture where cycling is a natural aspect of everyday life. Inspire ○ Raise support ○ Raise awareness. Grow your bike community and inspire people to explore the world by bike. We provide the movies, promotional graphics and marketing support. All you have to do is open the doors! Raise money for your non-profit or project. Spice up you Bike Week, National Bike Month, Bike to Work Week or similar event! Bring in funds for your organization. Raise awareness for a special project. As a Bike Share event. In conjunction with an Open Streets event. Because these movies are amazing on the big screen! Filmed by Bike was founded in 2003 in the bike-friendly community of Portland, Oregon. As cycling culture has grown, we have been here every pedal stroke of the way. We are experts on building a bike friendly community and we want to share this with the world! Let’s Get More People On Bikes! Cycling is fun and our efforts to get more people riding should also be fun! 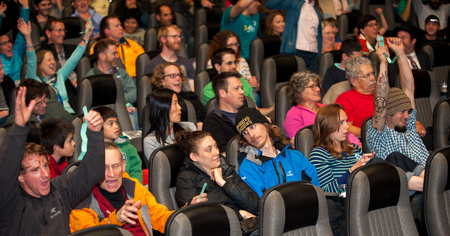 Filmed by Bike offers the perfect tool for your bike community toolkit – a ready-to-go film festival in a box. Just press play. We’re here to help, and make it easy for you! Our movie collections feature a mix of diverse, international films. The films are fun, short, thrilling and upbeat to delight a broad audience. + Other governmental entities, museums, trail funds, theaters, bike shops, cafes and businesses. + many other fantastic locations!